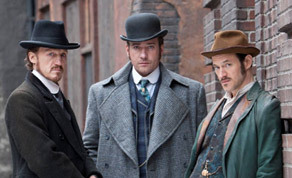 Principal photography has officially wrapped on BBC series ‘Ripper Street’ after an 18-week shoot in Dublin. The Clancy Barracks location, which was home to Whitechapel residents Jerome Flynn, Matthew Macfadyen and Adam Rothenberg’s characters Detective Drake, Inspector Reid and Captain Jackson, as well as a set which took eight weeks to build, is currently being dismantled after an 18 week-long shoot. Screen Scene VFX in Dublin is currently putting the finishing visual effects touches to the eight-part drama, while Egg Post Production, also based in Dublin, is looking after the full audio post and grading. Ed Bruce of Screen Scene VFX is the visual effects supervisor, while VFX producer Sarah Mooney and VFX coordinator Nick Murphy will manage a team of artists and all things VFX-related. For Egg Post production, colourist Sebastian Guest will grade the series, while Dominic Lord will serve as HD finisher and Howard Bargroff will be in charge of the sound mix. Úna Ní Dhonghaíle will work independently as she edits four episodes with Gareth Nolan assisting. Therese Caldwell, also independent from Egg, will act as post-production supervisor on the project. Speaking to IFTN during production, Irish set designer Mark Geraghty (Count of Monte Cristo) said it took an “eight-week intensive build” to create Whitechapel in 1889 in the Clancy Barracks location. Geraghty said he worked with a 40-strong Irish construction crew consisting of model makers, drafts people, art directors and assistant art directors. Geraghty and his team designed streets, a prison, a bar, and even a laboratory for the period drama. Speaking to IFTN before production ended, ‘Pride and Prejudice’ actor Matthew Macfadyen praised Geraghty for his work, calling him “really talented”. Both Macfadyen and Jerome Flynn (Game of Thrones) also appreciated Irish designer Lorna Marie Mugan’s period drama designs. Flynn said putting the costume on allowed him to “immediately feel like you’re in period so doing something in period helps, you just kind of mould into what you’re doing.” Mugan has just been nominated for an Emmy Award for her designs for Sky series ‘Treasure Island’. Macfadyen echoed Flynn’s statements, commenting: “I shouldn’t sound sentimental, but there does feel like a lovely atmosphere with the crew, and maybe it’s that a lot of things are filming here and there’s been a resurgence in big companies, it just feels like a lovely place to work. ‘Ripper Street’ is a co-production between Ireland’s Element Pictures and the UK’s Tiger Aspect Productions and Lookout Point. Will Gould is the executive producer for Tiger Aspect, while Richard Warlow (Waking the Dead) and Toby Finlay wrote the script. IFTA-winning cinematographer PJ Dillon (The Runway, Game of Thrones) worked on two episodes. It also stars American actor Adam Rothenberg, who plays mysterious doctor and ex-soldier Homer Jackson. Production ended last weekend, with the trio filming all over Dublin, including Clancy Barracks, the Phoenix Park and Trinity College. BBC One will air the series in autumn.